After the tragic murders in Orlando early on Sunday, we have seen a resurgence of expressions of Islamophobia. Our Muslim neighbors especially need our support now. I encourage everyone who is in town and who is available to come to this evening gathering that was planned long before Orlando. 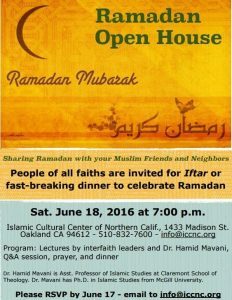 It is an open house during Ramadan at the evening break-fast or Iftar. I would be there if I were not out of town. Rabbi Dev will be there and she will speak representing our synagogue. Ramadan is the holy month of the Muslim calendar. People fast from before sunrise to after sunset. It is a custom to break fast with friends and family and we have been invited as friends of the ICCNC with whom we serve on “Faith Trio” for more than 16 years. 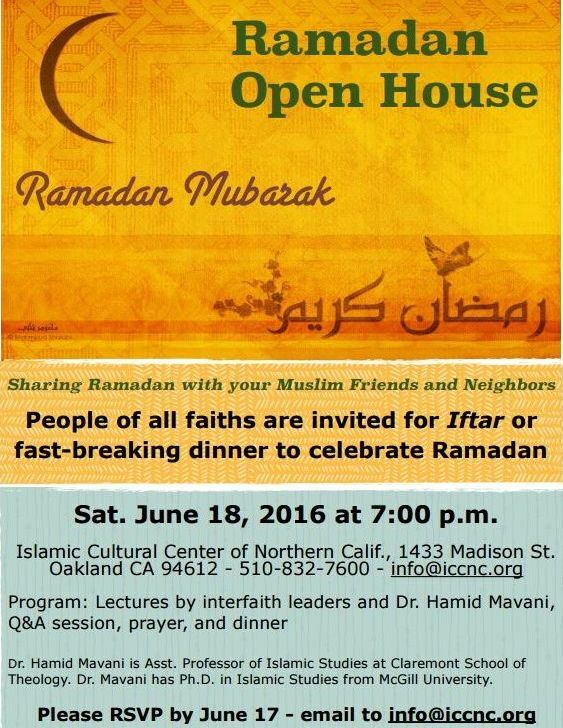 At the Islamic Cultural Center of Northern California, 1433 Madison Street near 14th, Oakland.